Acarbose Tablets are available for oral administration containing 25 mg, 50 mg or 100 mg acarbose. Each tablet contains the following inactive ingredients: colloidal silicon dioxide, magnesium stearate, microcrystalline cellulose and corn starch. Acarbose is a complex oligosaccharide that delays the digestion of ingested carbohydrates, thereby resulting in a smaller rise in blood glucose concentration following meals. As a consequence of plasma glucose reduction, acarbose reduces levels of glycosylated hemoglobin in patients with type 2 diabetes mellitus. Systemic non-enzymatic protein glycosylation, as reflected by levels of glycosylated hemoglobin, is a function of average blood glucose concentration over time. In contrast to sulfonylureas, acarbose does not enhance insulin secretion. The antihyperglycemic action of acarbose results from a competitive, reversible inhibition of pancreatic alpha-amylase and membrane-bound intestinal alpha-glucoside hydrolase enzymes. Pancreatic alpha-amylase hydrolyzes complex starches to oligosaccharides in the lumen of the small intestine, while the membrane-bound intestinal alpha-glucosidases hydrolyze oligosaccharides, trisaccharides, and disaccharides to glucose and other monosaccharides in the brush border of the small intestine. In diabetic patients, this enzyme inhibition results in a delayed glucose absorption and a lowering of postprandial hyperglycemia. Because its mechanism of action is different, the effect of acarbose to enhance glycemic control is additive to that of sulfonylureas, insulin or metformin when used in combination. In addition, acarbose diminishes the insulinotropic and weight-increasing effects of sulfonylureas. Acarbose is metabolized exclusively within the gastrointestinal tract, principally by intestinal bacteria, but also by digestive enzymes. A fraction of these metabolites (approximately 34% of the dose) was absorbed and subsequently excreted in the urine. At least 13 metabolites have been separated chromatographically from urine specimens. The major metabolites have been identified as 4-methylpyrogallol derivatives (that is, sulfate, methyl, and glucuronide conjugates). One metabolite (formed by cleavage of a glucose molecule from acarbose) also has alpha-glucosidase inhibitory activity. This metabolite, together with the parent compound, recovered from the urine, accounts for less than 2% of the total administered dose. The fraction of acarbose that is absorbed as intact drug is almost completely excreted by the kidneys. When acarbose was given intravenously, 89% of the dose was recovered in the urine as active drug within 48 hours. In contrast, less than 2% of an oral dose was recovered in the urine as active (that is, parent compound and active metabolite) drug. This is consistent with the low bioavailability of the parent drug. The plasma elimination half-life of acarbose activity is approximately 2 hours in healthy volunteers. Consequently, drug accumulation does not occur with three times a day (t.i.d.) oral dosing. The mean steady-state area under the curve (AUC) and maximum concentrations of acarbose were approximately 1.5 times higher in elderly compared to young volunteers; however; these differences were not statistically significant. Patients with severe renal impairment (Clcr < 25 mL/min/1.73 m2) attained about 5 times higher peak plasma concentrations of acarbose and 6 times larger AUCs than volunteers with normal renal function. No studies of acarbose pharmacokinetic parameters according to race have been performed. In U.S. controlled clinical studies of acarbose in patients with type 2 diabetes mellitus, reductions in glycosylated hemoglobin levels were similar in Caucasians (n=478) and African-Americans (n=167), with a trend toward a better response in Latinos (n=132). Studies in healthy volunteers have shown that acarbose has no effect on either the pharmacokinetics or pharmacodynamics of nifedipine, propranolol, or ranitidine. Acarbose did not interfere with the absorption or disposition of the sulfonylurea glyburide in diabetic patients. Acarbose may affect digoxin bioavailability and may require dose adjustment of digoxin by 16% (90% confidence interval: 8 to 23%), decrease mean Cmax of digoxin by 26% (90% confidence interval: 16 to 34%) and decreases mean trough concentrations of digoxin by 9% (90% confidence limit: 19% decrease to 2% increase). (See PRECAUTIONS: Drug Interactions). The amount of metformin absorbed while taking acarbose was bioequivalent to the amount absorbed when taking placebo, as indicated by the plasma AUC values. However, the peak plasma level of metformin was reduced by approximately 20% when taking acarbose due to a slight delay in the absorption of metformin. There is little if any clinically significant interaction between acarbose and metformin. • Acarbose was statistically significantly different from placebo at all doses. Although there were no statistically significant differences among the mean results for doses ranging from 50 to 300 mg t.i.d., some patients may derive benefit by increasing the dosage from 50 to 100 mg t.i.d. • Although studies utilized a maximum dose of 200 or 300 mg t.i.d., the maximum recommended dose for patients < 60 kg is 50 mg t.i.d. ; the maximum recommended dose for patients > 60 kg is 100 mg t.i.d. *Acarbose was statistically significantly different from placebo at all doses with respect to effect on oneâ€‘hour postprandial plasma glucose. ** The 300 mg t.i.d. acarbose regimen was superior to lower doses, but there were no statistically significant differences from 50 to 200 mg t.i.d. Acarbose was studied as monotherapy and as combination therapy to sulfonylurea, metformin or insulin treatment. The treatment effects on HbA1c levels and one-hour postprandial glucose levels are summarized for four placebo-controlled, double-blind, randomized studies conducted in the United States in Tables 2 and 3, respectively. The placebo-subtracted treatment differences, which are summarized below, were statistically significant for both variables in all of these studies. Study 1 (n=109) involved patients on background treatment with diet only. The mean effect of the addition of acarbose to diet therapy was a change in HbA1c of -0.78%, and an improvement of one-hour postprandial glucose of -74.4 mg/dL. In Study 2 (n=137), the mean effect of the addition of acarbose to maximum sulfonylurea therapy was a change in HbA1c of -0.54%, and an improvement of one-hour postprandial glucose of -33.5 mg/dL. In Study 3 (n=147), the mean effect of the addition of acarbose to maximum metformin therapy was a change in HbA1c of -0.65%, and an improvement of one-hour postprandial glucose of -34.3 mg/dL. Study 4 (n=145) demonstrated that acarbose added to patients on background treatment with insulin resulted in a mean change in HbA1c of -0.69%, and an improvement of one-hour postprandial glucose of -36 mg/dL. A one year study of acarbose as monotherapy or in combination with sulfonylurea, metformin or insulin treatment was conducted in Canada in which 316 patients were included in the primary efficacy analysis (Figure 2). 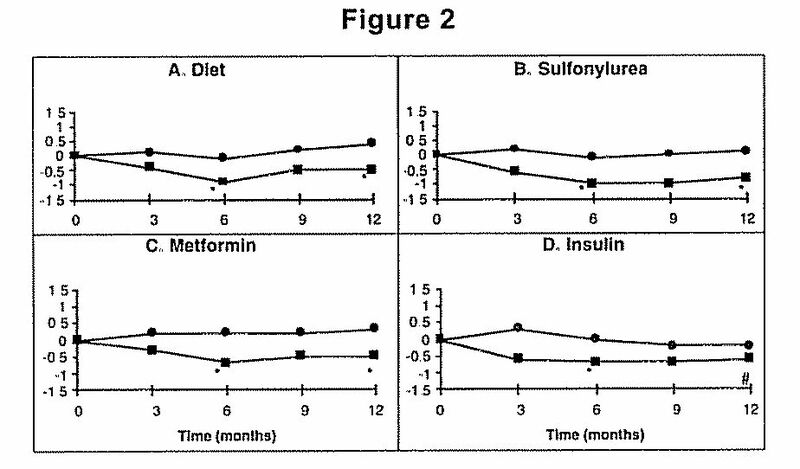 In the diet, sulfonylurea and metformin groups, the mean decrease in HbA1c produced by the addition of acarbose was statistically significant at six months, and this effect was persistent at one year. In the acarbose-treated patients on insulin, there was a statistically significant reduction in HbA1c at six months, and a trend for a reduction at one year. • Although studies utilized a maximum dose of up to 300 mg t.i.d., the maximum recommended dose for patients â‰¤ 60 kg is 50 mg t.i.d. ; the maximum recommended dose for patients > 60 kg is 100 mg t.i.d. • Although studies utilized a maximum dose of up to 300 mg t.i.d., the maximum recommended dose for patients â‰¤60 kg is 50 mg t.i.d. ; the maximum recommended dose for patients >60 kg is 100 mg t.i.d. Figure 2: Effects of acarbose (â– ) and placebo (â—) on mean change in HbA1c levels from baseline throughout a one-year study in patients with type 2 diabetes mellitus when used in combination with: (A) diet alone; (B) sulfonylurea; (C) metformin; or (D) insulin. Treatment differences at 6 and 12 months were tested: *p<0.01; # p=0.077. Acarbose Tablets are indicated as an adjunct to diet and exercise to improve glycemic control in adults with type 2 diabetes mellitus. Acarbose Tablets are contraindicated in patients with known hypersensitivity to the drug. Acarbose Tablets are also contraindicated in patients with diabetic ketoacidosis or cirrhosis. Acarbose Tablets are also contraindicated in patients with inflammatory bowel disease, colonic ulceration, partial intestinal obstruction or in patients predisposed to intestinal obstruction. In addition, Acarbose Tablets are contraindicated in patients who have chronic intestinal diseases associated with marked disorders of digestion or absorption and in patients who have conditions that may deteriorate as a result of increased gas formation in the intestine. There have been no clinical studies establishing conclusive evidence of macrovascular risk reduction with acarbose or any other anti-diabetic drug. Because of its mechanism of action, acarbose when administered alone should not cause hypoglycemia in the fasted or postprandial state. Sulfonylurea agents or insulin may cause hypoglycemia. Because acarbose given in combination with a sulfonylurea or insulin will cause a further lowering of blood glucose, it may increase the potential for hypoglycemia. Hypoglycemia does not occur in patients receiving metformin alone under usual circumstances of use, and no increased incidence of hypoglycemia was observed in patients when acarbose was added to metformin therapy. Oral glucose (dextrose), whose absorption is not inhibited by acarbose, should be used instead of sucrose (cane sugar) in the treatment of mild to moderate hypoglycemia. Sucrose, whose hydrolysis to glucose and fructose is inhibited by acarbose, is unsuitable for the rapid correction of hypoglycemia. Severe hypoglycemia may require the use of either intravenous glucose infusion or glucagon injection. In long-term studies (up to 12 months, and including acarbose doses up to 300 mg t.i.d.) conducted in the United States, treatment-emergent elevations of serum transaminases (AST and/or ALT) above the upper limit of normal (ULN), greater than 1.8 times the ULN, and greater than 3 times the ULN occurred in 14%, 6%, and 3%, respectively, of acarbose-treated patients as compared to 7%, 2% and 1%, respectively, of placebo-treated patients. Although these differences between treatments were statistically significant, these elevations were asymptomatic, reversible, more common in females, and, in general, were not associated with other evidence of liver dysfunction. In addition, these serum transaminase elevations appeared to be dose related. In US studies including acarbose doses up to the maximum approved dose of 100 mg t.i.d., treatment-emergent elevations of AST and/or ALT at any level of severity were similar between acarbose-treated patients and placebo-treated patients (p â‰¥ 0.496). In approximately 3 million patient-years of international post-marketing experience with acarbose, 62 cases of serum transaminase elevations > 500 IU/L (29 of which were associated with jaundice) have been reported. Forty-one of these 62 patients received treatment with 100 mg t.i.d. or greater and 33 of 45 patients for whom weight was reported weighed < 60 kg. In the 59 cases where follow-up was recorded, hepatic abnormalities improved or resolved upon discontinuation of acarbose in 55 and were unchanged in two. Cases of fulminant hepatitis with fatal outcome have been reported; the relationship to acarbose is unclear. When diabetic patients are exposed to stress such as fever, trauma, infection, or surgery, a temporary loss of control of blood glucose may occur. At such times, temporary insulin therapy may be necessary. Patients should be told to take acarbose orally three times a day at the start (with the first bite) of each main meal. It is important that patients continue to adhere to dietary instructions, a regular exercise program, and regular testing of urine and/or blood glucose. Acarbose itself does not cause hypoglycemia even when administered to patients in the fasted state. Sulfonylurea drugs and insulin, however, can lower blood sugar levels enough to cause symptoms or sometimes life-threatening hypoglycemia. Because acarbose given in combination with a sulfonylurea or insulin will cause a further lowering of blood sugar; it may increase the hypoglycemic potential of these agents. Hypoglycemia does not occur in patients receiving metformin alone under usual circumstances of use, and no increased incidence of hypoglycemia was observed in patients when acarbose was added to metformin therapy. The risk of hypoglycemia, its symptoms and treatment, and conditions that predispose to its development should be well understood by patients and responsible family members. Because acarbose prevents the breakdown of table sugar, patients should have a readily available source of glucose (dextrose, D-glucose) to treat symptoms of low blood sugar when taking acarbose in combination with a sulfonylurea or insulin. If side effects occur with acarbose, they usually develop during the first few weeks of therapy. They are most commonly mild-to-moderate gastrointestinal effects, such as flatulence, diarrhea, or abdominal discomfort, and generally diminish in frequency and intensity with time. Therapeutic response to acarbose should be monitored by periodic blood glucose tests. Measurement of glycosylated hemoglobin levels is recommended for the monitoring of long-term glycemic control. Acarbose, particularly at doses in excess of 50 mg t.i.d., may give rise to elevations of serum transaminases and, in rare instances, hyperbilirubinemia. It is recommended that serum transaminase levels be checked every 3 months during the first year of treatment with acarbose and periodically thereafter. If elevated transaminases are observed, a reduction in dosage or withdrawal of therapy may be indicated, particularly if the elevations persist. Monitoring glycemic control with 1,5-AG assay is not recommended as measurements of 1,5-AG are unreliable in assessing glycemic control in patients taking acarbose. Use alternative methods to monitor for glycemic control. Plasma concentrations of acarbose in renally impaired volunteers were proportionally increased relative to the degree of renal dysfunction. Longâ€‘term clinical trials in diabetic patients with significant renal dysfunction (serum creatinine > 2 mg/dL) have not been conducted. Therefore, treatment of these patients with acarbose is not recommended. Certain drugs tend to produce hyperglycemia and may lead to loss of blood glucose control. These drugs include the thiazides and other diuretics, corticosteroids, phenothiazines, thyroid products, estrogens, oral contraceptives, phenytoin, nicotinic acid, sympathomimetics, calcium channel-blocking drugs, and isoniazid. When such drugs are administered to a patient receiving acarbose, the patient should be closely observed for loss of blood glucose control. When such drugs are withdrawn from patients receiving acarbose in combination with sulfonylureas or insulin, patients should be observed closely for any evidence of hypoglycemia. Sulfonylurea agents or insulin may cause hypoglycemia. Acarbose given in combination with a sulfonylurea or insulin may cause a further lowering of blood glucose and may increase the potential for hypoglycemia. If hypoglycemia occurs, appropriate adjustments in the dosage of these agents should be made. Very rarely, individual cases of hypoglycemic shock have been reported in patients receiving acarbose therapy in combination with sulfonylureas and/or insulin. Intestinal adsorbents (for example, charcoal) and digestive enzyme preparations containing carbohydrate-splitting enzymes (for example, amylase, pancreatin) may reduce the effect of acarbose and should not be taken concomitantly. Acarbose has been shown to change the bioavailability of digoxin when they are coadministered, which may require digoxin dose adjustment. (See CLINICAL PHARMACOLOGY: Drug-Drug Interactions). Eight carcinogenicity studies were conducted with acarbose. Six studies were performed in rats (two strains, Sprague-Dawley and Wistar) and two studies were performed in hamsters. In the first rat study, Sprague-Dawley rats received acarbose in feed at high doses (up to approximately 500 mg/kg body weight) for 104 weeks. Acarbose treatment resulted in a significant increase in the incidence of renal tumors (adenomas and adenocarcinomas) and benign Leydig cell tumors. This study was repeated with a similar outcome. Further studies were performed to separate direct carcinogenic effects of acarbose from indirect effects resulting from the carbohydrate malnutrition induced by the large doses of acarbose employed in the studies. In one study using Sprague-Dawley rats, acarbose was mixed with feed but carbohydrate deprivation was prevented by the addition of glucose to the diet. In a 26-month study of Sprague-Dawley rats, acarbose was administered by daily postprandial gavage so as to avoid the pharmacologic effects of the drug. In both of these studies, the increased incidence of renal tumors found in the original studies did not occur. Acarbose was also given in food and by postprandial gavage in two separate studies in Wistar rats. No increased incidence of renal tumors was found in either of these Wistar rat studies. In two feeding studies of hamsters, with and without glucose supplementation, there was also no evidence of carcinogenicity. Acarbose did not induce any DNA damage in vitro in the CHO chromosomal aberration assay, bacterial mutagenesis (Ames) assay, or a DNA binding assay. In vivo, no DNA damage was detected in the dominant lethal test in male mice, or the mouse micronucleus test. Fertility studies conducted in rats after oral administration produced no untoward effect on fertility or on the overall capability to reproduce. The safety of acarbose in pregnant women has not been established. Reproduction studies have been performed in rats at doses up to 480 mg/kg (corresponding to 9 times the exposure in humans, based on drug blood levels) and have revealed no evidence of impaired fertility or harm to the fetus due to acarbose. In rabbits, reduced maternal body weight gain, probably the result of the pharmacodynamic activity of high doses of acarbose in the intestines, may have been responsible for a slight increase in the number of embryonic losses. However, rabbits given 160 mg/kg acarbose (corresponding to 10 times the dose in man, based on body surface area) showed no evidence of embryotoxicity and there was no evidence of teratogenicity at a dose 32 times the dose in man (based on body surface area). There are, however, no adequate and well-controlled studies of acarbose in pregnant women. Because animal reproduction studies are not always predictive of the human response, this drug should be used during pregnancy only if clearly needed. Because current information strongly suggests that abnormal blood glucose levels during pregnancy are associated with a higher incidence of congenital anomalies as well as increased neonatal morbidity and mortality, most experts recommend that insulin be used during pregnancy to maintain blood glucose levels as close to normal as possible. A small amount of radioactivity has been found in the milk of lactating rats after administration of radiolabeled acarbose. It is not known whether this drug is excreted in human milk. Because many drugs are excreted in human milk, acarbose should not be administered to a nursing woman. Safety and effectiveness of acarbose in pediatric patients have not been established. Of the total number of subjects in clinical studies of acarbose in the United States, 27% were 65 and over, while 4% were 75 and over. No overall differences in safety and effectiveness were observed between these subjects and younger subjects. The mean steady-state area under the curve (AUC) and maximum concentrations of acarbose were approximately 1.5 times higher in elderly compared to young volunteers; however, these differences were not statistically significant. Gastrointestinal symptoms are the most common reactions to acarbose. In U.S. placebo-controlled trials, the incidences of abdominal pain, diarrhea, and flatulence were 19%, 31% and 74% respectively in 1255 patients treated with acarbose 50 to 300 mg t.i.d., whereas the corresponding incidences were 9%, 12% and 29% in 999 placebo-treated patients. In a one-year safety study, during which patients kept diaries of gastrointestinal symptoms, abdominal pain and diarrhea tended to return to pretreatment levels over time, and the frequency and intensity of flatulence tended to abate with time. The increased gastrointestinal tract symptoms in patients treated with acarbose are a manifestation of the mechanism of action of acarbose and are related to the presence of undigested carbohydrate in the lower GI tract. Small reductions in hematocrit occurred more often in acarbose-treated patients than in placebo-treated patients but were not associated with reductions in hemoglobin. Low serum calcium and low plasma vitamin B6 levels were associated with acarbose therapy but are thought to be either spurious or of no clinical significance. Additional adverse events reported from worldwide postmarketing experience include fulminant hepatitis with fatal outcome, hypersensitive skin reactions (for example, rash, erythema, exanthema and urticaria), edema, ileus/subileus, jaundice and/or hepatitis and associated liver damage, thrombocytopenia, and pneumatosis cystoides intestinalis (see PRECAUTIONS). There have been rare postmarketing reports of pneumatosis cystoides intestinalis associated with the use of alpha-glucosidase inhibitors, including acarbose. Pneumatosis cystoides intestinalis may present with symptoms of diarrhea, mucus discharge, rectal bleeding, and constipation. Complications may include pneumoperitoneum, volvulus, intestinal obstruction, intussusception, intestinal hemorrhage, and intestinal perforation. If pneumatosis cystoides intestinalis is suspected, discontinue acarbose and perform the appropriate diagnostic imaging. Unlike sulfonylureas or insulin, an overdose of acarbose will not result in hypoglycemia. An overdose may result in transient increases in flatulence, diarrhea, and abdominal discomfort which shortly subside. In cases of overdosage the patient should not be given drinks or meals containing carbohydrates (polysaccharides, oligosaccharides and disaccharides) for the next 4 to 6 hours. During treatment initiation and dose titration (see below), one-hour postprandial plasma glucose may be used to determine the therapeutic response to acarbose and identify the minimum effective dose for the patient. Thereafter, glycosylated hemoglobin should be measured at intervals of approximately three months. The therapeutic goal should be to decrease both postprandial plasma glucose and glycosylated hemoglobin levels to normal or near normal by using the lowest effective dose of acarbose, either as monotherapy or in combination with sulfonylureas, insulin or metformin. Once a 25 mg t.i.d. dosage regimen is reached, dosage of acarbose should be adjusted at 4 to 8 week intervals based on one-hour postprandial glucose or glycosylated hemoglobin levels, and on tolerance. The dosage can be increased from 25 mg t.i.d. to 50 mg t.i.d. Some patients may benefit from further increasing the dosage to 100 mg t.i.d. The maintenance dose ranges from 50 mg t.i.d. to 100 mg t.i.d. However, since patients with low body weight may be at increased risk for elevated serum transaminases, only patients with body weight > 60 kg should be considered for dose titration above 50 mg t.i.d. (see PRECAUTIONS). If no further reduction in postprandial glucose or glycosylated hemoglobin levels is observed with titration to 100 mg t.i.d., consideration should be given to lowering the dose. Once an effective and tolerated dosage is established, it should be maintained. The maximum recommended dose for patients â‰¤ 60 kg is 50 mg t.i.d. The maximum recommended dose for patients > 60 kg is 100 mg t.i.d. 25 mg tablets are supplied as round, white to off-white, biconvex tablets, debossed with product identification â€œ54â€ over â€œ311â€ on one side and plain on the other side. 50 mg tablets are supplied as round, white to off-white, biconvex tablets, debossed with product identification â€œ54â€ over â€œ737â€ on one side and plain on the other side. 100 mg tablets are supplied as round, white to off-white, biconvex tablets, debossed with product identification â€œ54â€ over â€œ251â€ on one side and plain on the other side. Store at 20° to 25°C (68° to 77°F). [See USP Controlled Room Temperature.] Protect from moisture. For bottles, keep container tightly closed.